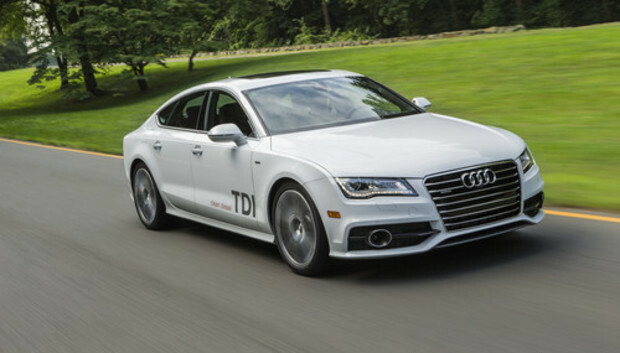 I was driving to Target in a car that I could trade for a good chunk of the inventory--the $81,395 Audi A7 TDI Quattro. It has a cornucopia of buttons and tech features, and almost every one of them does something cool. Suddenly this honey-do' road trip took on some high-tech potential. I started by hitting the Nav button and using Google Earth to plot my roadtrip. Why Google Earth? Because you can. Because this is a German luxury car. Just because. In my driveway, I could pan and scan around my yard, look at a country road from a bird's eye view, and inspect my neighbor's pool. There's nothing quite like seeing your local gas station shown from the heavens as you drive around town. And if you're actually lost, this feature is great for getting your bearings. I scrolled down to see a weather forecast, current fuel prices, and some movie listings. Blah, blah. Most Nissans have this feature now. What impressed me were concert listings in my area. I noticed Iris Dement, the classic country singer, was performing nearby that night. Both Google Earth and the Info screens work at all times, no matter how fast you are driving. You can also set destinations in the nav while driving. Audi limits a few things like reading full news stories; for those, you have to park. The next button on my list looked like something you'd use to set the parking brake, but it actually shows the A7's around-view cameras. The knob is located in the center console and changes the view from behind the car, to the side, and out in front. The cameras keep rolling as you drive up to 12 mph, and they're helpful for seeing curbs, line markings, children and pets, and just about anything that might be within about two feet of the car. Just pulling into a parking place became a vivid experience--I could see the cracks in the pavement (they really need to get those fixed). Part of me wondered whether just turning my head to the side and looking out the window would have been more cost-effective. And maybe a littler harder on my neck. Tough choice. Are these features worth it? Honestly I'm torn on the issue. I would have never found out about that Iris Dement concert or noticed those cracks in the Target parking lot. But let's talk about the fees. First, the "Corner View Camera" addition is part of the Driver Assistance Package in the Audi A7, which also includes adaptive cruise control and lane-keeping. It costs $2,800 extra. That's a lot of cash to see parking-lot bumpers up close. For Google Earth and the Info screens, you'll pay $15 per month if you agree to a three-year T-Mobile contract, or $30 on a month-to-month basis. It makes you suddenly appreciate your iPhone's navigation features. But isn't that all just a rounding error on an $81,395 car? Here's my final answer. The base price of the A7 is just under $65,000. You can go ahead and splurge if you really want the cameras and safety features. If your goal is to merge into traffic faster than a Ford Fusion, and in more style, the base A7 can still do the job.